Considering the lines stretching around the block ten years ago to witness one of nature’s masterpieces, you might want to arrive early when the National Botanic Garden opens its doors. Trained botanists, tropical ecologists, and naturalists must queue patiently alongside curious visitors from Toledo. All eagerly await a chance to pay homage to the world’s largest flowering plant, the titan arum, now opening (literally) at the Garden. This floral extravaganza will likely run a few more days before Amorphophallus titanum returns to normal life and goes out of bloom. Check out the live webcam here. When I visited the titan arum on exhibit, I joined a crowd milling around this all-star among aroids, many asking to be photographed next to it. The horticulturists-in-charge, or perhaps the titan arum’s ‘handlers,’ had deliberately placed the titan on a floral throne decorated with lesser plants in the same family (Araceae)—its jealous and more familiar potted cousins, the Anthurium and the Phyllodendron—kneeling below it at the base. 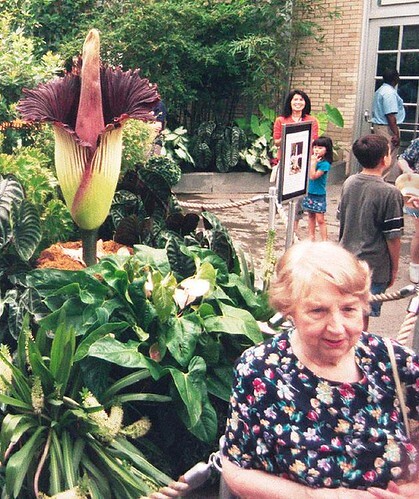 By the time I arrived there was no evidence of the stench from its giant flower (technically an inflorescence, a cluster of many tiny flowers borne on a stalk) for which the titan arum is most notorious, an odor said to resemble a decomposing corpse. Many tropical plants pollinated by carrion flies and beetles produce flowers that smell like old socks or worse. The titan arum and its cohort of stinkers are cleverer than we think: by drawing in with its rank odor reliable pollen carriers in a dense rainforest, it succeeds in outcrossing. This is where an individual plant increases its fitness by breeding with another relative some distance away—what Darwin himself termed as “nature’s urge.” (The flower of our local pawpaw, a species that boasts many close relatives abiding in Sumatra’s rainforests next to the titan arum, gives off the same corpse scent, if much more muted than the titan arum’s inflorescence). Even without the telltale aroma, the titan arum is a spectacular feat of evolution, like the fronds of a leafy sea dragon or the feathers of a peacock, and almost as ephemeral as a firefly’s glow. How tragic to think that most of the remaining natural habitat of the titan arum may disappear before this individual, one of the last in its lineage, decides to flower again. I imagined what it would be like to discover the titan arum in full flower in its native haunts in the lowland rainforests of Sumatra: after sweat-soaked hours of trudging through the mud and flicking off leeches, to smell something odd—a dead leaf monkey, a rotting tapir?—and then to stumble upon the biological reward of a lifetime. Even a short audience with such spectacular species like the titan arum, the symbol of Sumatra, reminds us of why we must save the rainforests. What could be more opposite to a titan arum in aesthetic appeal than a honeysuckle vine? 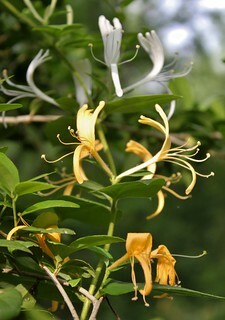 The very name honeysuckle signifies summer and childhood to many who grew up in the eastern U.S. But most of the flowers we bit into as kids come from a form that is most invasive—the Japanese honeysuckle. 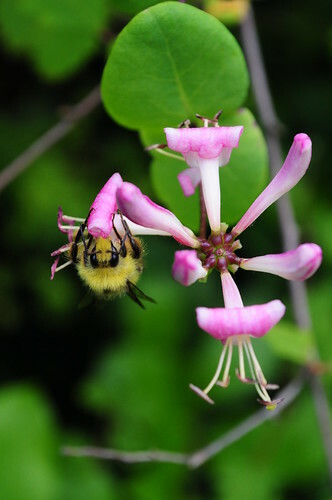 In fact of the eight species of honeysuckle (genus Lonicera) in the DC/MD/VA flora, only one is native—the trumpet honeysuckle (L. sempervirens—sempervirens means evergreen which it is not here but is further south). If you want to see it, or even better, bite into the nectar at the base of the flower, get ready for some Really Local Nature: simply walk out the back door of WWF and cross the driveway to the retaining wall of the building behind us. You will notice a sprawling plant with long tubular yellow flowers. This showy shrub is a cultivated version of the wild trumpet honeysuckle that sports bright red flowers. As much as we love to bite into honeysuckle flowers, so do a group of insects that break the code between plant and pollinator. One reason why there are nearly 300,000 species of flowering plants and more than thousands of insects that visit them is that most play by the rules. The rules of Nature that is: over millions of years of evolution insects have figured out how to use flowers and plants, in turn, have adapted to take advantage of the insects around them. By producing a sugar-rich reward in the form of nectar that insects need, flowering plants attract insects and even vertebrates like bats, birds, and rodents to their flowers and use these mobile creatures to spread their pollen. The guiding theory here is that the plants benefit by having their pollen transported over greater distances and with greater accuracy than if they relied on more wasteful wind pollination. 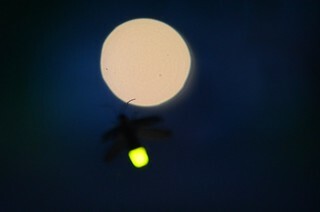 Biologists call this relationship between a trumpet honeysuckle and its main pollinator, the Ruby-throated Hummingbird, or even a titan arum and a carrion fly a mutualism—where both participants gain through the interaction in the struggle to survive and pass on one’s genes; the bird or insect benefit from a high-energy food source, and the plants spread their reproductive bits more efficiently about the landscape. Almost every situation in nature though has its cheaters. Darwin himself noticed that some species of bees have learned to steal nectar from azalea and honeysuckle flowers by piercing the flowers without bothering to pollinate them. Thus, clever bees with tiny tongues—too short to reach down the tube of our parking lot honeysuckle—make a hole in the flower near the base. Through this flower piercing even flowers too long to reach its nectaries through the main entrance and designed to keep out the riffraff except for long-tongued hummingbirds become fair game. Nectar robbing is common in our backyard bumblebee. On your next break, you too can be a nectar robber, but please leave a few flowers for the hummingbirds. One final ecological note: the Japanese honeysuckle and its Asian cousins are terrible invaders of our local forests. Their fruits are eaten by native birds, dispersed, and germinate on the forest floor and along forest edges. The deer don’t eat the plants and so they spread throughout the understory, choking or shading out the natives. The last thing a conservation biologist should do is welcome a non-native honeysuckle into one’s yard. Yet that is exactly what I have done. I have transplanted, largely for aesthetic rather than ecological reasons, a locally rare non-native honeysuckle into my backyard full of native plants. A special place has been allotted to Lonicera fragrantissima, also known as January jasmine (pictured here). It’s a rather scruffy-looking honeysuckle but the aroma is like nothing you have smelled before. Imagine a honeysuckle that smells like a citrus flower—why it is called fragrantissima—but that blooms around here in mid-February, the first shrub to do so in our region. What better harbinger of Spring than one specimen of this bush, far from it’s native China, but here to signal the end of winter with its intoxicating aroma?